Sergeant Kerrissa Michael, of the NYPD’s Community Affairs/Youth Services department, discusses its community outreach work on gangs and child safety with Chapter Leader Victor Victoria of Brooklyn’s PS /IS 384. Sharon Jones-Williams of the union’s school safety department and Luz Alvarez and Carolyn Roman, members of the Family Child Care Providers Chapter executive board, model the bags that came in handy for stuffing with literature, curriculum guides and more. Miller Photography Picking up information at the Gay, Lesbian and Straight Education Network booth are (from left) Scott Stringer, the Manhattan borough president; David Kazansky, the UFT school safety director; Lillian Kohler, a Staten Island special representative; and Christina Hepburn, a paraprofessional at Susan Wagner HS. 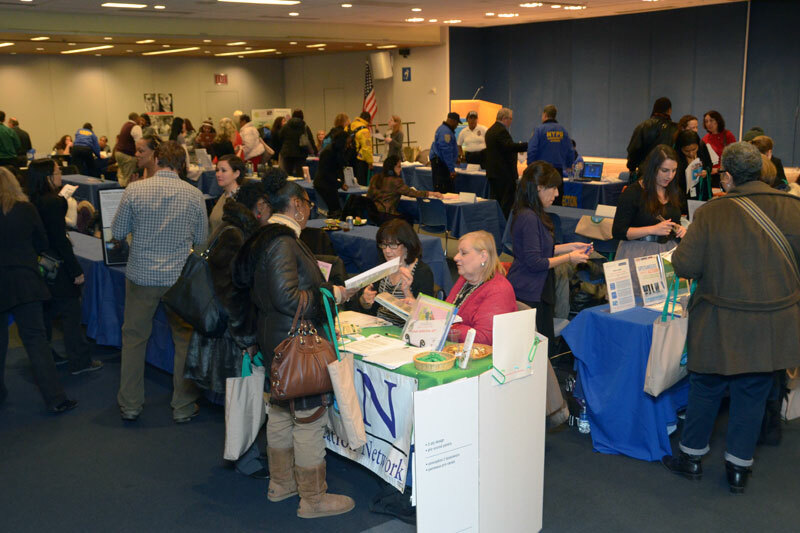 With nearly 40 exhibitors on hand, teachers, guidance counselors, parents, administrators and others who turned out for the union’s anti-bullying fair at UFT headquarters on Jan. 29 found a range of new resources, programs and ideas to bring back to their schools. Chapter Leader Victor Victoria of PS/IS 384 in Bushwick said he wanted to involve all the stakeholders at his school — parents, students and teachers — in confronting bullying because, like all other city schools, his is not immune to the problem. “I’d like to get workshops for parents to learn how to deal with issues their kids might be facing, and I’d like to train staff to be better prepared to help kids facing bullying,” he said. Paraprofessional Christina Hepburn said that Susan Wagner HS, Staten Island, where she works, has been very supportive of anti-bullying initiatives, even sending her to a four-day therapeutic intervention training program. She noted that just the day before she had done a presentation that was “well-received” by 90 paraprofessionals at her school. Parent coordinator Lois Schwartz of the Brooklyn Studio Secondary School, a Grade 6-12 school in Bensonhurst, said that faculty at her school started doing presentations for the middle school grades and now hope to bring in more resources for the high school students. Carolyn Roman and Luz Alvarez, members of the UFT Family Child Care Providers Chapter executive board, said they came to the fair because it was relevant for their work, too. “Even 4-year-olds can bully younger children, and this information is good to share with providers and parents,” Roman said. “If we can catch it at an early age, it’s a step in the right direction and can possibly stop a tragedy from happening,” Alvarez added. The annual fair, now in its second year, is just one facet of the union’s BRAVE campaign against bullying, said David Kazansky, the UFT school safety director who initiated the campaign and the day’s event. Miller PhotographyThe fair gave UFT members, parents and administrators the opportunity to gather information and learn about services offered by nearly 40 exhibitors.